02/15/2016 Darling of the Day: Lupita Nyong’o Mixes Hard & Soft Like A Pro! During a recent photocall for her new Broadway show Eclipsed, Oscar-winning actress & style icon Lupita Nyong’o made fashion headlines with a chic & modern combination of hard & soft in a floral button-down shirt, paired with a leather skirt & blue ballet flats. The sweet look is perfect for transitioning from day to night, going from the office to happy hour, as well as finding new ways to wear your favorite wardrobe staples while on a budget. SHOP: American Living shirt ($38.99, was $49.50) @Macy’s, skirt ($22.90) in black @Forever 21, Tommy Hilfiger flats ($32.99) @6PM, & earrings ($5.00, was $12.50) @Icing. The total for this amazing look (before tax) is a whopping $99.88, an awesome bargain & inspiration for any shopper looking to pinch some pennies while not sacrificing her style. I’m always thinking about my readers of all shapes & sizes, which is why I also wanted to share some inspiration for a similar & fabulous plus-size look, including a Chaps shirt @Kohl’s & a faux leather Guess skirt @Lord & Taylor. What do you think of Lupita’s winter-spring look? Would you wear floral with faux leather? Which celebs inspire you to experiment with your style? For more fabulous posts, check out Victoria Beckham’s latest street style, Olivia Palermo’s debut collection with Chelsea28 for Nordstrom, & red carpet inspiration from A-listers like Alicia Vikander & Lucy Hale. Happy Styling! 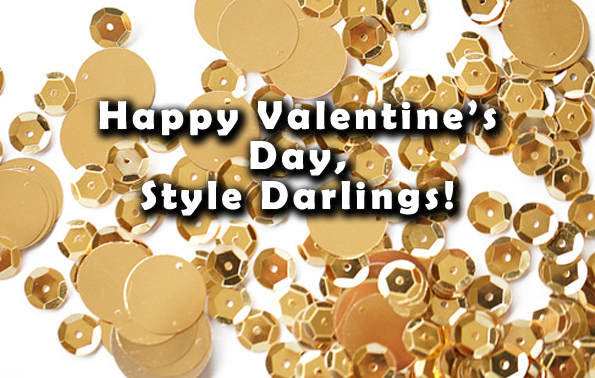 The Stylish Five: Love-Themed Accessories Just In Time For Valentine’s Day! It’s less than a week until Valentine’s Day & there’s plenty of love-themed ways to amp up your style when it comes to hearts, lips, graphics, & sparkle. I wear hearts all year long since they’re my favorite shape & I’m always indulging in heart-adorned accessories this time of year, especially with jewelry. They’re flirty & add some humor to any outfit during the year, but they can also help you get into the holiday spirit. With that in mind, I clicked around on some of my favorite websites for some love-themed accessories that are both affordable & functional for any style. 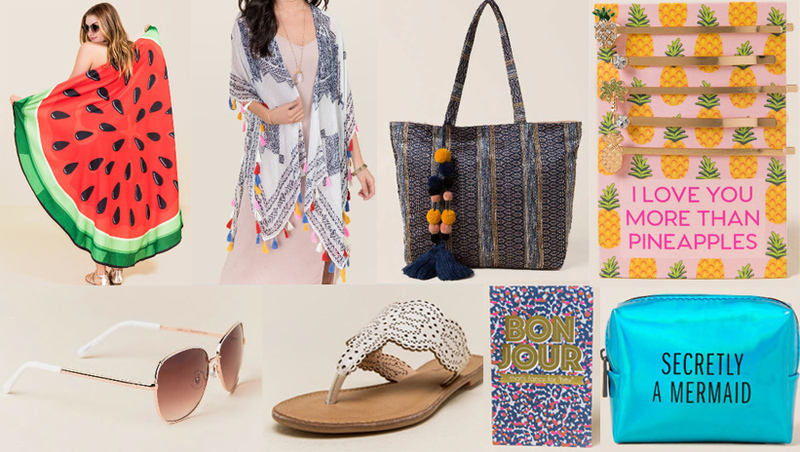 SHOP: 1. scarf ($13.99, was $28.00) @Kohl’s (use code BEMINE for 20% off online orders over $75), 2. watch ($15.00) @Charming Charlie (FREE SHIPPING on online orders over $50), 3. clutch ($34.00) @GOjane (FREE SHOPPING on online order over $50), 4. bangle ($7.90) in gold @Forever 21 (FREE SHIPPING on online orders over $50), & 5. stud earrings ($3.00, was $5.50) @Icing (use code SURPRISE for 10% off online orders). SHOP: 1. sweater ($32.95) @Shoptiques, 2. tee ($10.17, was $22.11) @Romwe, 3. crop top ($44.50) @Torrid (available in sizes 0-6), & 4. shoes ($22.99, was $74.99) @ModCloth. What are you looking to wear this romantic holiday weekend? What plans do you have to keep it stylish? Do you wear love-themed accessories or separates? For possible Valentine’s Day gift items for your loved one or besties, check out Francesca’s, Dress Barn, Nordstrom, Burlington Coat Factory, Banana Republic, & Chico’s. Happy Styling! 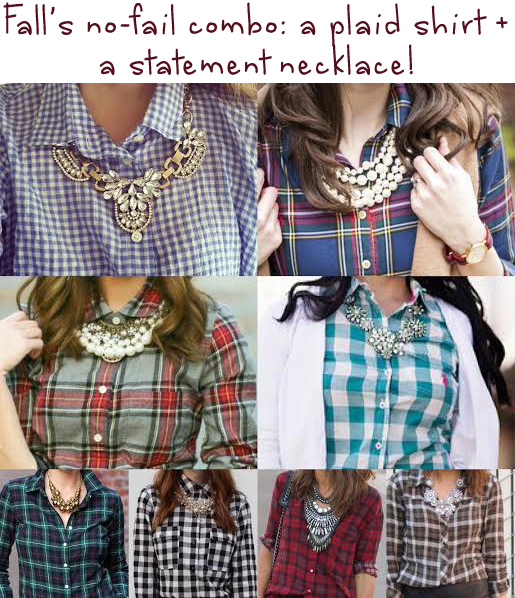 Basics for a Bargain: The Plaid + Statement Necklace Combo for Fall, Inspired by Katy Perry, Rachel Zoe & More! My posts are a bit far & few between these days- I’m working on my grad thesis, but that hasn’t stopped me from being inspired to expand my wardrobe & accessories choices this fall. The season is certainly in full swing & I’m thinking about my cozy / glam look for Thanksgiving. I have the plaid + statement necklace combination on the brain, especially since my statement necklace obsession is at its peak. Who wouldn’t be too? There’s so much inspiration every time I check out my favorite celebrity style blogs & Pinterest, when style stars are winning the statement necklace game. This includes the always flawless Olivia Palermo, The Honest Company founder Jessica Alba, pop star Katy Perry, The Real cohost Adrienne Bailon, the fearless Rihanna, former Gossip Girl actress Leighton Meester, model Amber Rose, & stylist / designer Rachel Zoe. I couldn’t NOT share some of my favorite street style images from Pinterest, which have inspired this latest post. There are so many different color combos & metal choices to wear when considering plaid & jewelry. The pairing instantly dresses up a work look, makes date night a little more flirty, & mixes up your weekend favorites for a more glamorous options. It was tough narrowing down which plaid shirts & statement necklaces to select & feature, especially when I have a budget in mind for my readers & savvy shoppers who are looking for affordable fixes to any wardrobe rut. Also, I was eager to select a variety of jewels like rhinestones, beads, or pearls to coordinate with varieties of plaid shirts for any body type. Style knows no size, after all! SHOP: 1. classic plaid flannel shirt ($22.00, was $26.94) in red tartan @Old Navy (available in sizes XS – XXL) & bib necklace ($14.90) @Forever 21, 2. vintage wash plaid shirt ($29.95) @Love Culture & statement necklace ($16.99) @Charlotte Russe, 3. Attention plaid shirt ($15.39, was $21.99) @KMart & coin fringe necklace ($6.99, was $12.90) @Wet Seal, 4. plaid shirt ($38.50, was $55.00) in blue @Avenue (available in sizes 18-32) & leaf necklace ($10.40, was $12.99) @Target, & 5. plaid button down shirt ($40.00) in black / white @Dress Barn (available in sizes 1X – 3X) & Apt. 9 pearl necklace ($13.99, was $24.00) @Kohl’s. If you’re still stuck on how to style this already seemingly busy pairing, what with some major bling over a pattern, think about basics that are not only rich in texture, but luxe in hue. Tuck your plaid shirt into slim bottoms like a pencil skirt or your favorite dark denim skinny jeans. Since fall is all about layers, try out a faux fur vest in a neutral or stylish jacket to reinvent your ensemble. SHOP MORE: 1. side split midi skirt ($25.50) in burgundy @Missguided, 2. high waist skinny jeans ($69.50) in indigo @LOFT (sign up for emails & get 40% off), 3. faux fur vest ($26.97, was $54.00) in black @Nordstrom Rack, & 4. crepe jacket ($24.99) in red @H&M. 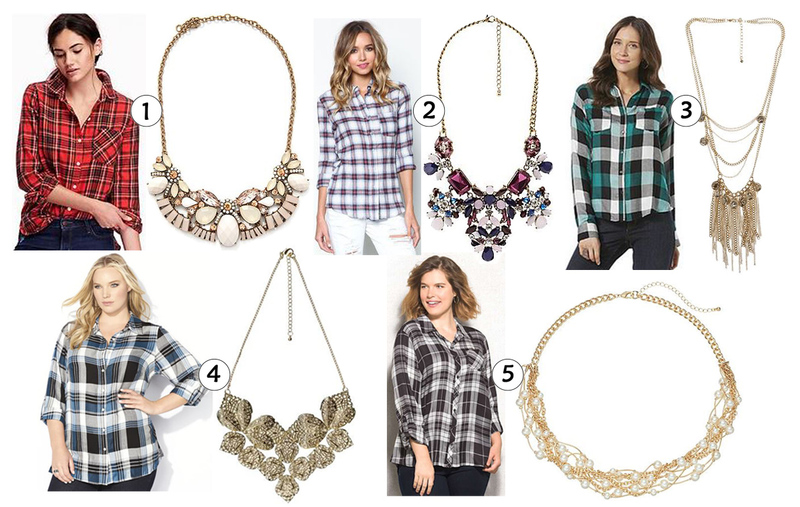 Which plaid & necklace combination speaks to your style? Which celebrity’s statement jewelry game inspires you? For more stylish posts, check out budget-friendly earrings inspired by Jennifer Lawrence & Angelina Jolie, Olivia Palermo’s cover shoot for Holt Renfrew’s new site, how to get Victoria Beckham’s menswear look for less, & Louis Vuitton’s The Spirit of Travel campaign starring Michelle Williams & Alicia Vikander. Happy Styling! The Stylish Five: Affordable Fall Florals For Every Size! When it comes to fall fashion, I immediately think of luxe fabrics & jewel tones, mixed with layers to keep warm & look cool at the same time. A fashionable twist on your every day fall look includes lightened up floral pieces to blend with heavier ones, like a leather jacket, chunky knits, fringe tote, or suede booties. Here’s where you can play with color in your wardrobe, using contrasting prints to reinvent fall classics like houndstooth or buffalo plaid. SHOP: 1. floral sweater ($34.50) in navy / grey @Dress Barn (shop plus size here), 2. floral dress ($29.90) in black / natural @Wet Seal (shop plus size here), 3. jacquard leggings ($12.48, was $24.95) in black @Hollister (shop similar plus size here), 4. floral skirt ($14.98, was $49.95) @New York & Company (shop similar plus size here), & 5. floral bomber jacket ($24.99, was $60.00) @JC Penney (shop similar plus size here). When it comes to fall fashion, do you wear florals? Do you prefer printed tops over bottoms? Where are you shopping for the best deals this season? For more posts, check out cozy capes & ponchos inspired by Taylor Swift & Kim Kardashian, Olivia Palermo’s newest jewelry collaboration with Bauble Bar, Sienna Miller’s chic take on menswear, & Anne Hathaway’s playful look for a recent Good Morning America appearance while promoting The Intern. Happy Styling!